As an avid cook and food obsessive, I obviously have absolutely tons of cookbooks, however as I love to experiment and also have lots of old favourites that I like to make time and time again, I rarely get round to actually trying (and sticking to) a full recipe from one of these books. I received Lorraine Pascale’s How to be a Better Cook for Christmas and thought it was a fantastic opportunity to give something new a go. I asked for this book specifically for Christmas as I really enjoyed the TV series and watching Lorraine teaching people of varying skill levels how they could put together some really tasty dishes with no difficulty whatsoever. The book follows through with this theme, as the recipes are all really tasty but not ridiculously long and with no complicated processes or weird ingredients that you can’t get in the supermarket. Everything is very doable. 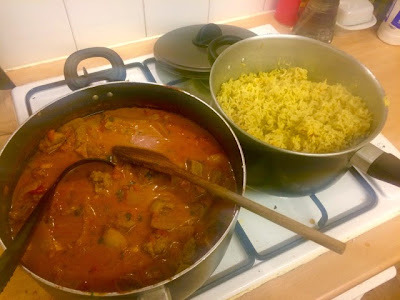 I chose to make the Lamb Rogan Josh recipe as I was cooking for a big group of friends at The Boyfriend’s house which was a real mixed bunch and also included two children. 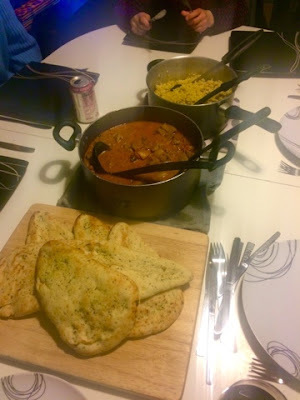 I thought that a big curry would firstly be a really easy recipe to double the quantities so we had loads of food for everyone to tuck into and also it’s not too hot or spicy so wouldn’t be offensive to anyone and easy on the kids. The whole recipe was really simple to put together and the recipe really easy to follow. The only thing that I did think was a little inconvenient for the amateur chef was that there were a lot of different spices involved. If unlike me, you don’t already have a well stocked cupboard full of herbs and spices, this recipe could prove a little expensive if you have to go and and buy the lot. My favourite part of this dish was the saffron rice. It was so tasty, if saffron wasn’t so expensive I’d cook rice this way every time! The recipe went down a treat with everyone and the kids really loved it with everyone helping themselves to seconds and even thirds so it’s definitely a crowd pleaser which I’d definitely make again.